I was on the Flannel Friday Facebook page recently, and Lisa of Thrive After Three was asking how to clean the fabric for her felt table. I didn't know how to do so, but I went to her blog and the felt table intrigued me. I'd had felt boards out for the kids play, and I've blogged about them in the past. But <sigh> like everything else I've put out for my families to use, I'd been burned. Someone actually STOLE the Thanksgiving turkey I made(!) and the pieces for the boards ended up, like all my other toys, being stuffed randomly into any container available. So the idea of a felt table sounded like it was worth a try. I got several yards of blue and green felt from the fabric store. It ended up being more than I needed, but that's fine--I can always use excess felt. My tables are square, not round, so it was a little trickier setting one up. I cut off some excess, rubber banded it to the legs as best I could and used some Velcro to secure it at the bottom. 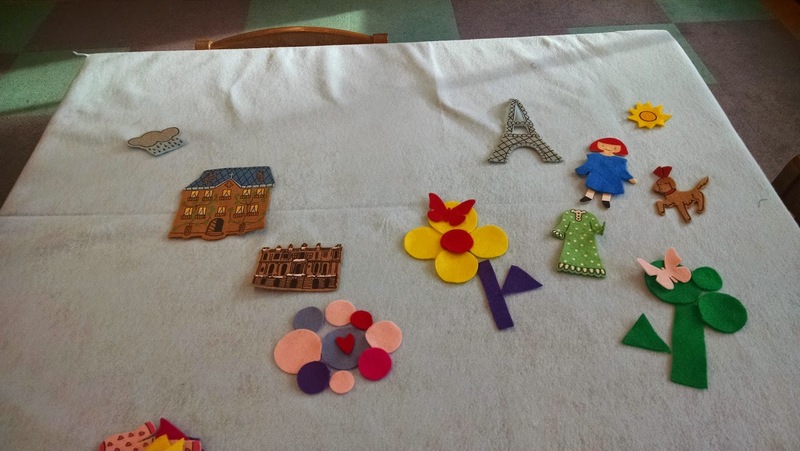 I found some of the "Madeline" felt pieces but couldn't find the box of shapes I had made for the previous So I just used my beloved Sizzix machine to cut some felt squares, circles and triangles. I also have a die that came with the machine that does hearts and butterflies, so I added those two. The train pieces from the ever talented Melissa Depper's blog--and I still want to make a few more pieces. The cars came from Nancy Stewart's music site. In fact, I think I've probably blogged about them already because they go with her "Lots of Cars" song/game, which is a big hit around here! 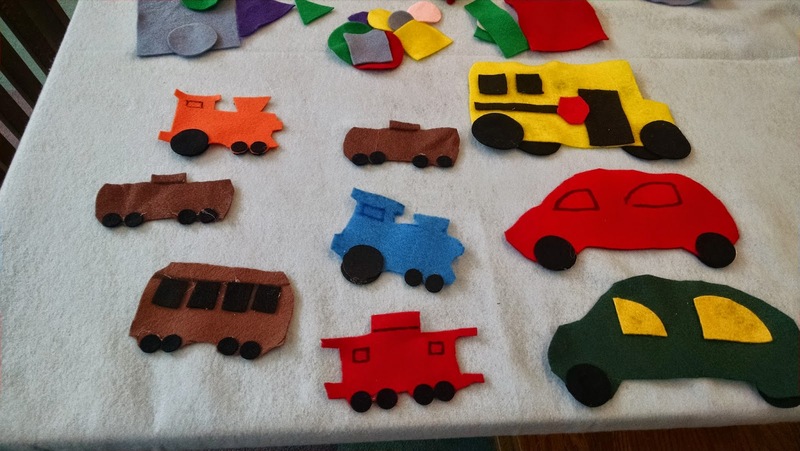 And the school bus is made from the same pattern I used for this week's "take home" craft--only I gave the kids just the template for the bus's body, while I used my Sizzix to make doors, windows and wheels. So far, so good. Not only am I seeing kids using the table, but most of the pieces are remaining ON the table when they're done.Keep your fingers crossed for me, because I want to keep going with this from month to month. I'm waiting on a leaf die for my Sizzix to add later this month and I think I can easily find some pre-cuts for Halloween. I don't have the turkey from last year, but I still have the feathers. That's all for today. This week's Flannel Friday is being hosted by Ms Kelly. And you can find all things flannel on the Flannel Friday blog and the Flannel Friday Facebook page!